A guide to intelligent cat deterrents to keep your home and garden free from stray and feral cats. We cover acoustic ultrasonic devices, smell and taste repellents as well as automatic water sprinklers. Ultrasonic products stop stray and feral cats from using your lawn or garden as a toilet. Ultrasonic cat deterrents emit an acoustic sound that is above the hearing range of most humans but perfectly audible to the cat. The cat associates the burst of ultrasonic sound with the location and learns to avoid the area in the future. When choosing an ultrasonic cat deterrent make sure that the product has a motion sensor that automatically senses the cat and conserves energy. Do ultrasonic cat deterrents always work? Ultrasonic cat deterrents work with most cats. 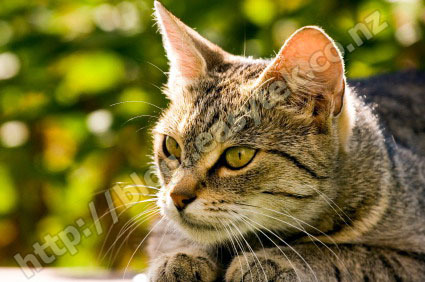 There is always the occasional cat that suffers from hearing loss or damage that will not respond to ultrasonic sound. Choose a quality product is also important because these products have usually been tested with various cat breeds and provide a stable frequency and sound output over the lifetime of the product. A popular recipe to deter your neighbour's cat is using a smell or taste aversion product. These come either as spray or liquid. There are also a number of homemade recipes available online which often include some form of pepper, hot chili etc. While some (but not all) taste aversion products work, there is one major problem with them: They do need frequent reapplication, e.g. after rain or snow. Various commercial products are available as well home recipes. Google 'cat smell deterrents' for more information. Everybody know that cats hate water. So why not use this know how to keep them away from sandpits, gardens, flower and veggie beds? Automatic water sprinklers consist of a motion detector that senses movement of the offending cat. When the cat comes into range it simply turns on the sprinkler for a few seconds. Commercial products use a combination of a startling blast of water together with a sudden unexpected noise to create a memorable and unpleasant experience for the offending cat. Similar to ultrasonic cat deterrents, the animal associates this unpleasant experience with the area and learns to avoid similar surprises in the future. The major advantage of a water sprinkler over an acoustic product is that these work even with deaf cats (as long as the cat hates am unexpected blast of water which nearly all cats do). Owning a cat is extremely popular for many Kiwis. Statistics show that almost 50% of all Kiwi families host at least one cat. The popularity of cats often leads to an impressive number of cats in your garden and back yard. Cat poo problems are therefore common. But there is another issue associated with a high cat population in your backyard: Cats are predators to other wildlife. While this may be welcoming news if you have mice or rats in your home or garden, cats pose a very real and serious threat to many birds and native animals. The good news is that there is a simple solution to "bird proof" your cat without sacrificing the quality of life for your feline friend. All you need to do is put a small bell on your cats collar. When the cat moves or jumps the sound of the bell will alarm birds and other small animals giving them time to get away before the cat can strike. Stray cats are pet cats that have been lost or abandoned by their owner. A feral cat is a domesticated cat that has returned to the wild. Feral cats are born in the wild. The offspring of stray cats become feral cats if they are born in the wild.